Set away in a forested location, with direct access to a beachfront and uninterrupted sea views, The View Villa is a holiday home that ticks off all the right boxes for a tropical getaway. The building features wide open spaces and expansive glass walls, so you’ll feel at one with the surroundings when lounging within. A full range of five-star amenities, including impeccable on-site service, a private infinity pool and breezy beachside sala completes your stay. The guests are comfortably accommodated in five bedrooms. Two of the rooms are located on the third floor, and come complete with king beds, flat screen TVs and private teakwood terraces with sea views. The ensuites are generously proportioned; one features an indoor-outdoor shower, while the other is outfitted with an indoor shower alcove and outdoor bathtub. Of the remaining, three bedrooms are located in stand-alone pavilions, providing guests with ultimate privacy. The rooms also feature wraparound balconies, as well as glass-walled shower alcoves with tropical views. Additionally, the villa also provides three bunk beds dorm which could accommodate up to 6 children. An infinity pool with jacuzzi stretches out across the pool deck, its glimmering waters tempting vacationers to take a dip to cool off from the heat. Gathering outdoors at the deck is a must-do every evening, because the jaw-dropping sunset scenery is not to be missed. Alfresco meals are best enjoyed at the outdoor dining area (complete with built-in barbecue facilities), located right by the pool bar. A second seafront terrace doubles up as an outdoor massage venue. Living spaces at The View are spread out across three storeys. 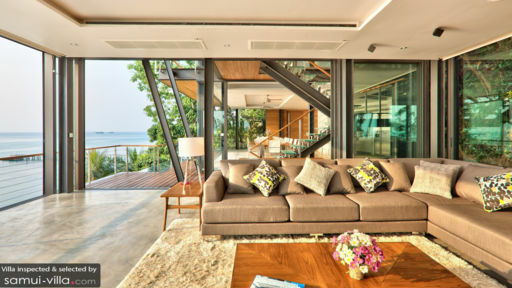 Lofty ceilings and glass walls create spaces that are airy and sun-drenched, with breathtaking views out to the sea. A glass staircase leads from the upper floor bedrooms down to the main living area, pool deck, terrace and bar. The plush living area is outfitted with a pull-down projector screen and pillowy sofas, and is located across from a capacious dining area with an open kitchen and breakfast bar. There’s also a fully equipped gym for guests looking to follow through with their fitness routines while on holiday. Daily breakfast service, personal guest services, housekeeping services and 1 airport transfers are included with your stay. Amenities available at additional cost include villa pre-stocking, in-villa lunches and dinners, late or early check-ins or check-outs, travel activities, child minding services and additional beds. 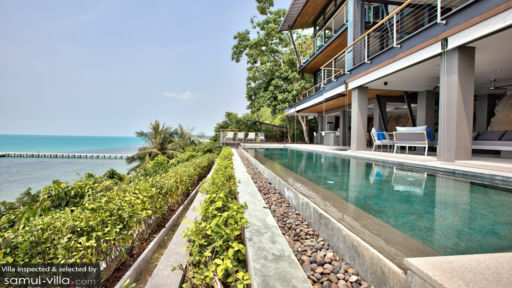 The View is located in Taling Ngam, West Samui. With its unspoilt nature, stunning sunsets and serene ambience, Taling Ngam Beach and its surrounding vicinity lends itself well to vacationers seeking a restful getaway. Taling Ngam Beach is largely undeveloped (with the exception of a handful of luxury vacation properties), and has shallow waters that are ideal for snorkeling. While you won’t find many restaurants along the beach, you’re within a stroll or quick drive from dining establishments like The Island View Restaurant and Nikki Beach Club. Other venues, like Hemingway’s on the Beach, Jahn and a variety of seafood restaurants within Thongkrut Fisherman’s Village are about 12 to 20 minutes’ drive from the beach. Marga Yoga, a breezy seafront yoga studio that comes complete with an on-site vegan cafe offers an invigorating experience. Or treat yourself to an incredible spa ritual at Baan Thai Spa. 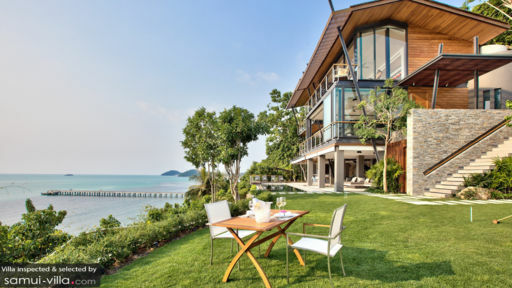 Located within the InterContinental Samui Taling Ngam Resort, the spa enjoys a clifftop venue and lush surroundings, and features a widespread selection of treatments, including body scrubs, herbal baths, facials and massages. In-villa massages and yoga sessions may be arranged at request - simply let your villa manager know! Plan your day trips around cultural attractions like Laem Sor Pagoda, Khao Chedi, Secret Buddha Garden and the Samui Cultural Center. Or visit the Angthong Marine Park, an archipelago of 42 islands that draws visitors with its wide-ranging activities. Go for a swim, snorkel in the crystal clear waters or kayak around the islands to take in the picture-perfect landscape. It takes a 45-minute boat ride to arrive at the destination. Speed boats depart from Nathon Pier, located about 25 minutes’ drive from your villa.